When shopping for a new pair of headphones, an audiophile only knows one kind: Over-ear. 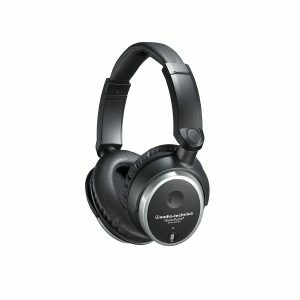 That’s because the over-ear construction is not only the most comfortable, but also the one that allows for the largest possible drivers and thus, better sound. They’re also more efficient at blocking annoying sounds coming from outside, which is commonly referred to as ‘noise isolation’. They may not be for everyone, especially due to their large size and sometimes bulky appearances, but if you truly value sound quality, there’s no getting around a pair of over-ear headphones. In this overview, we’ll look at the market segment’s top performers, reviewing all of them to give you a perspective on what kinds of headphones to buy and which to simply ignore. So, what’re you waiting for? Want to find out what the best over ear headphones are for your money or not? Everyone in the portable audio world knows Sennheiser. Their products combine good looks, expert craftsmanship and, most importantly, many different over-ear designs with the best sound the market has to offer often at a very high price. The PXC-series is Sennheiser’s travel offering, designed to combine the advantages of over-ear headphones with convenience and luxury features. It aimed at the kind of consumer who doesn’t stay in one place for too long, such as collapsible earcups and headband, wireless Bluetooth connectivity and noise cancelling. For a pair of over-ear headphones, the PXC 550 the flagship model of the entire line looks quite sleek and stylish. Sennheiser have really outdone themselves when it came to designing an over-ear pair to take with you ‘on the move’. The Bluetooth functionality allows for connections with almost any portable audio device, as does the optional 3.5mm cable. Furthermore, the PXC 550s possess very thick cushioning and are of the closed-back kind, so not only will no-one hear what you’re listening to, but chances are you won’t hear them, either. 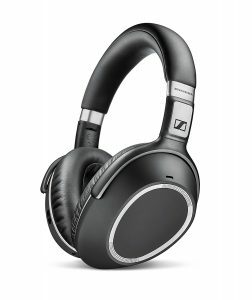 On the off chance that you find yourself in a seriously loud environment, the active noise cancelling will drown out any and all sounds from outside, letting you focus on the music the Sennheisers provide. On the subject of sound, you get traditional Sennheiser quality. In simple terms, the PXC 550s sound as amazing as any other Sennheiser product in their price range, which is arguably the most important thing besides all the convenience gadgets and sleek looks. We could talk for hours about the PXC 550s greatness, but let us finish the review this way: These are some of the best over-ear consumer-grade headphones money can buy, and they’re certainly the best over-ear travel headphones. Just be warned: They come at a price. $400, to be exact. 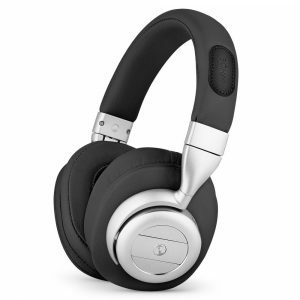 Want a pair of over-ear headphones that’s light, looks nice, has great sound and can connect to almost any portable device? 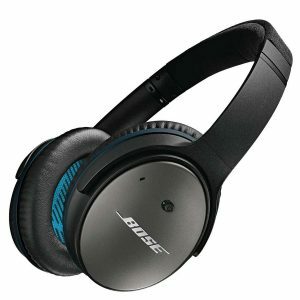 The Bose QuietComfort 25s are a good place to start. Made by a well-known manufacturer, albeit one that has experienced its fair share of controversy among audiophiles, the QC25s lie in the mid-range in terms of price, being offered for about $280. They combine great noise cancelling, a compact, collapsible design optimized for portability and above average sound into one concise package. However, quality control problems have surfaced in the few years since the QC25s initial release. For example, the folding mechanism, as convenient as it is, is also prone to breaking. Furthermore, the comfortable, cushioned earpads may wear off much faster than initially expected. Build quality problems like these are unfortunately common on this particular model, but if you can forgive those, what you get here is a perfect all-rounder in the world of over-ear headphones with some nice gimmicks to boot. 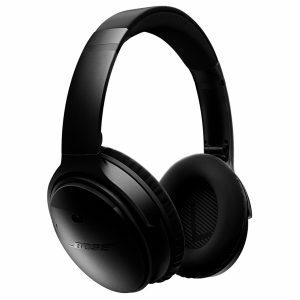 Just in case the Bose QuietComfort 25 are not enough for you, there’s the more upmarket model, the QC35. This pair, priced at $330, possesses a cleaner, more professional look compared to its slightly smaller sibling. With larger drivers, the 35s are also capable of producing sound that is deeper and richer than their sister model and are equipped with the same active noise cancelling tech. 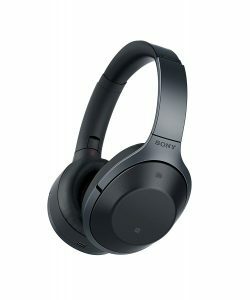 With about 20 hours of battery life and the same Bluetooth with integrated NFC as on the QC25s, these look like a great deal. But what about the various issues that plagued that model? Well, we are happy to report that the headband on the QC35 has been reinforced, so breakage is unlikely. Additionally, materials are sturdier and more durable all-around, though the overall construction is still mostly plastic. The danger of the device falling apart was fortunately combated pretty effectively by Bose, but there’s a new issue at hand, specific to the QC35. That would be the integrated controls mounted on the earcups. They’re just not as intuitive as any that you would find on similar headphones. Stiff buttons, poor, unergonomic placement and a complicated control layout all lead to quite the stressful experience when you’re trying to change tracks, raise or lower volume or modify any other setting. Still, overall, the QuietComfort 35s are a solid pair of over-ear headphones and definitely an improvement over the QC25s. 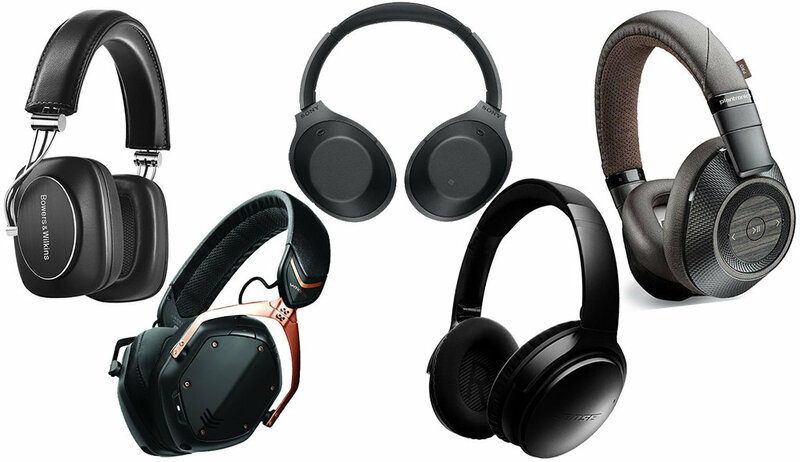 On the hunt for high-quality over-ear headphones, Sennheiser and Bose are not your only options. There’s also Sony, a third company renowned for their long history of success when it comes to consumer audio. Their halo product, the MDR1000X, are avantgarde over-ear, Bluetooth-capable luxury headphones with touch controls and an integrated microphone. Sporting modern, subdued looks and large drivers, the MDRs not only provide the wearer with great sound and refinement, but the noise cancelling is equally on par with offerings from any other big manufacturer in the business. All in all, the MDRs are very potent performers and don’t need to shy away from being compared to the likes of Sennheiser or Bose. Yes, the price is a bit high, but you get what you pay for. In order not to make the same mistake as Bose with the QuietComfort 35s, Sony spent a lot of time refining the MDR1000Xs controls. For the purpose of streamlining them, they chose capacitive touch surfaces instead of conventional buttons. These do clean up the looks of the MDRs, but they also over-complicate the control layout. Imagine a regular touchpad, such as the ones installed on various laptops, but instead of a handful of gestures, there are dozens, each correlating to a different function. It will take quite a while to get used to these controls, and even upon having done so, one will find they’re just not as intuitive as a good set of buttons. Talk about a waste of effort, eh? For those without wallets that know no bounds, Sennheiser actually manufactures a number of budget-oriented models. Fusing their world-renowned craftsmanship with more affordable designs and less ultra-luxury features whilst retaining all the important stuff like their signature sound quality, connectivity with the latest devices and comfort. The HD 598 Cs is a perfect example of this. A closed-back version of the otherwise extremely similar HD 598, the Cs model features a combination of high-grade sound and passive noise isolation. The low-key exterior doesn’t promise much, but the Sennheiser badge on the earcups makes these headphones’ statement clear. This is a quality product, no matter the sticker price. Unlike some more pompous headphones on our list, the HD 598 Cs is a purely wired device without any Bluetooth connectivity which would have driven up the price and defeated the purpose of the device to begin with. Instead, there are two different cables provided, one with a studio-grade 6.3mm and one with a more conventional 3.5mm auxiliary plug. These are easily interchangeable and make the HD 598 Cs compatible with almost any device capable of audio playback. The rest of the Sennheisers’ feature set or lack thereof follows the same formula, namely that this is an audio device first and foremost. You will have trouble finding any proper bells and whistles here, but what you get is some of the best sound quality on the market for less than $150. 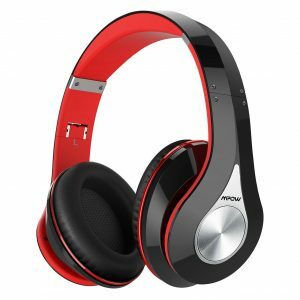 The very creatively titled Mpow Bluetooth Headphones by, well, Mpow, aim to please by being just one thing: A working set of headphones for an outrageously, unbelievably low price. $34. Not even that, $33.99, to be exact. You could buy a pair of run-of-the-mill tennis shoes from any department store for more than that. You could buy a eplacement set of earpads for any higher-end headphones for that price. Or perhaps, how about a brand new pair of Mpow Bluetooth Headphones? Now, how do these actually fare in real-world testing, you ask? Not necessarily how we expected them to. Almost anything and everything about the Mpows is either average or subpar. The battery life, clocking in at 13 hours, is not up to snuff with most, if any other recent model currently available, as is the sound, which, we assume, could be said to be ‘good’ given the low price, but that’s only because we’ve never tested any headphones in this price range to compare it to. Ever. At least the looks will satisfy some. They try to emulate the sleek, compact design that has been made popular by the Beats by the Dr.Dre line, and we must admit they don’t look that bad. For further practicality, they can also be folded down, so that’s something. And they even feature Bluetooth version 4.0! Sure, the connectivity is borderline awful, with very limited range, but it does work. Oh, and, don’t expect any large sums of comfort. These are not meant to be worn that much, we assume. But, honestly speaking, we were surprised to see that the Mpow Bluetooth Headphones actually worked right out of the box with no real issues. Sure, they are full of design flaws and various inferiorities compared to other headphones out there, but for the price of a good pair of sunglasses, you are really getting a lot. A whole lot. Interested in budget headphones, Read our article on Best Headphones Under 100 & Best Earbuds Under 100. This headphone by ALZN are a pretty standard pair of over-ear headphones. Wireless, good-looking, luxurious without the high price tag. Just what the average buyer is looking for, isn’t it? Let’s take a closer look. Surveying their specifications, this Headphone do seem to tick all the right boxes. 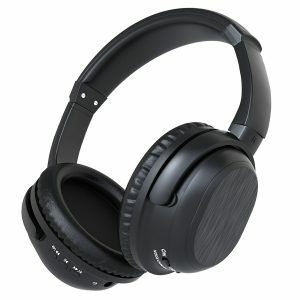 Full-size drivers, Bluetooth, active noise cancelling, protein cushioned earpads and even a microphone are all included. And do they work? Surprisingly, yes. And even quite well. Sure, you can’t expect anything on par with much more expensive models, especially from any of the big name brands, but the fact that little-known ALZN were able to produce such a well-rounded product at the low cost of $73 is commendable. There are not many innate flaws with this headphone, but that doesn’t mean there aren’t any at all. For example, the buttons used to control playback and volume are all clustered around the earcups, and, due to their size, it’s pretty difficult to press one without inadvertently hitting the adjacent buttons as well. We think you can imagine how frustrating it can be to simultaneously raise the volume and switch to the next track by accident. Furthermore, the headband, although it possesses a metal finish, is actually made out of cheap plastic, which can and will break easily. In spite of their looks, the ALZN are not that durable. One more contender for the prize of ‘best affordable luxury headphones’ is the BÖHM B76, coming in at $110 and loaded with a truckload of upmarket gadgetry. You get extra-large cushioned earpads, an aluminum finish, Bluetooth connectivity, active noise cancelling, hands-free calling with the integrated microphone and 16 hours of playtime. Sounds like a great package for just over $100, so what’s the problem? As with many in this price range, the BÖHM B76 suffers from build quality issues above all. For example, the aluminum finish we mentioned? Colored plastic. The headband, although it is padded and cushioned on the outside, is revealed to be nothing more than a flimsy, thin plastic bar when dismantling it. We assume that this will be just as prone to breakage over time as some of the BÖHM’s competitors, such as the ALZN BH519s above. In all other regards, though, the B76s do mostly hold up quite well. The sound is nice, and all the built-in extras work as they should for the price. However, BÖHM’s choice of materials and the way these headphones are put together is worrying, if not a reason to avoid them. From a manufacturer as renowned as Audio-Technica, one doesn’t expect a budget product such as the ATH-ANC7Bs, but yet here they are. Designed as the ultimate entry-level headphones, this pair combines over-ear comfort with great sound, comfort, high build quality and…not much else. But at least you can get them for $100, right? Well, on the subject of sound, the Audio-Technicas don’t disappoint, that much is clear. You do get more than what you would expect from a $100 product here, but the big trade off is the lack of any extra features besides the ubiquitous noise cancelling. Okay, so there is a collapsible frame and that can come in handy, but really, that, the noise cancelling and the sound itself is all that the ANC7Bs have got to offer you. Whether you consider that sufficient in a product like this is your choice, of course. The name is quirky, we’ll give them that, and the wide range of colors including pink and neon green should appeal to almost anyone, even though the wide disparity in price between them (simple black goes for $50 on Amazon, whilst red starts at $90) induces head-scratching. Still, the overall intent behind these headphones is clear: They’re hip, stylish and efficient, both in terms of features and price. At least they’re supposed to be. In real-life testing, we found that the sound coming out of the PumpZone’s full-size 40mm drivers was reasonably crisp for such a low price. 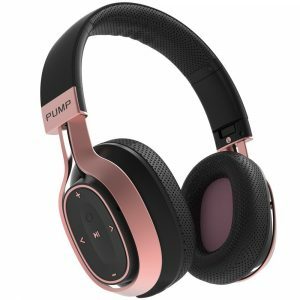 Though not competitive with any other headphones on our list except the ultra-budget Mpow Bluetooth Headphones, perhaps. Like many ‘lifestyle’ headphones, they emphasize on over-represented, thumping, loud bass instead of proper clarity, making them sound over-the-top and exagerrated. Apart from sound quality, there’s some pretty good noise cancelling built-in as well as Bluetooth 4.1 with NFC, a built-in mic, foldable headband and touch controls on the earcups. You already know what we thought about the Sony MDR1000X’s controls of this kind; now what do you think happens when one tries to implement the same in a product about a fifth of the price of the MDRs? Nothing impressive. Well, at least they work at all, one could say. This may have been pretty obvious from the start, but let’s face it: The Sennheiser PXC 550s are some of the best consumer-grade over-ear headphones money can buy (besides the $1,500+ HD 800 S also by Sennheiser). Every great feature we listed on any of our chosen picks it’s there on the PXC 550, refined so well it almost seems stupidly over-designed. But yet, looking at the Sennys, they still manage to present themselves as elegant, effortlessly stylish and efficient. Or, in other words, the PXC 550s, with the best sound in the industry, the best noise-cancelling in the industry, the best comfort and craftsmanship in the industry and the best looks in the industry, well, they are the best over-ear headphones out there. If money is no object, get these. So, which headphones did you like best? Do you concur with us choosing the PXC 550? No matter what your opinion may be, this overview should have granted you a basic understanding of the makeup of the current over ear headphone market. So even if you didn’t share our thoughts on every product we reviewed, you should now possess the necessary knowledge to make an educated buying decision of your own. We hope you find your perfect pair!